The last of my grandmothers passed away this last weekend. She had been unwell and very frail for a while, but there is somehow still a void now that she is actually gone. I haven’t lived in the same city as her for some years now, and have visited only intermittently. We communicated via postcards I sent and phone calls she made. We grew apart as I grew up – she belonging to an old world of rules that I could never quite understand, a prim-and-properness that I fought against. The year I spent at chef school is probably the most I saw her in my adult life. We talked a lot about food that year – a common ground we both understood and liked. I went to visit her a few weeks ago. She was mostly bed-ridden and moved in and out of consciousness so that conversation was difficult. In that time my aunt realised that my grandmother never wrote down any of her recipes. 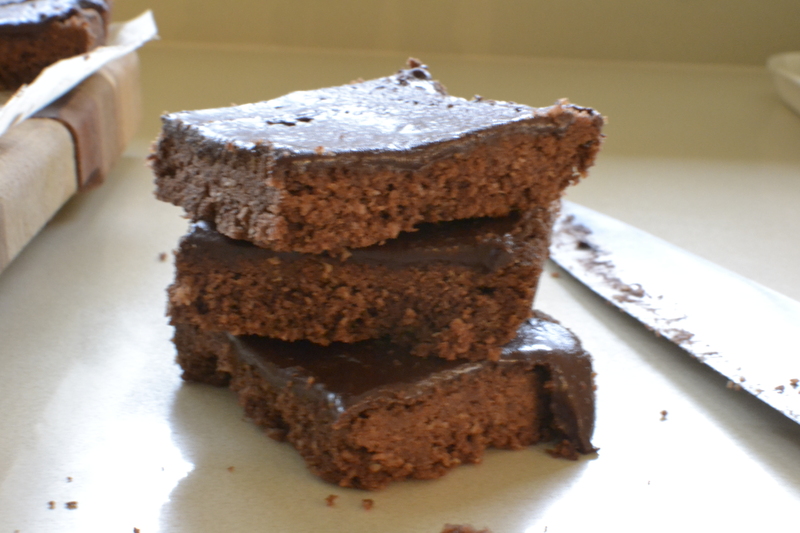 She was looking for this recipe for chocolate fudge biscuits as she didn’t have it and it is a family staple. My grandmother would remember parts of it but then drift off somewhere else. My aunt eventually got the recipe almost right. In our foraging attempts to find a copy we found a hand-written recipe journal that belonged to my great-grandmother (and namesake) but very little of my grandmother’s actual recipes – things written from Jamie or Nigella which are perfectly accessible anyway. I always remember those years, as a child, when we spent Christmas in Cape Town. Her tiny kitchen was always filled to the brim with polystyrene trays filled with pink and white coconut ice, golden crunchies, and these dark chocolate fudge biscuits. She gave them away to people and there was always a large supply for the family. She must’ve been obsessed with coconut because all three recipes are heavy with the stuff. Now, we all know that coconut is one of my least favourite flavours but this week, I found myself craving the taste of one of her chocolate fudge biscuits. And whilst she did not write anything down (she made everything from memory it seems), my mother has the recipe amongst her collection. (Apparently she asked my grandmother for it when we were small children.) For me, these biscuits are a reminder of Christmas in Cape Town. And of a specific (and yet I cannot remember the details) road trip my father and I took one year, where we drove from Cape Town (I assume to Johannesburg) with a white ice-cream tub full of these biscuits that she had made for him. Grease and line a 33cm x 25cm x 2cm rectangular tin. Preheat the oven to 180C. Place all the ingredients for the biscuits except the butter in a bowl. Melt the butter. Pour the melted butter into the dry ingredients and stir until all combined. Press the mixture into the baking tin, making sure it is evenly spread. Bake for 20 minutes – the biscuits should be firm but soft. Whilst the biscuits are baking, make the icing. Put the cocoa powder in a small bowl. Add in a teaspoon of hot water at a time, until you have a fairly thick paste. Let this cool slightly. Add in the butter and vanilla, followed by the icing sugar. (Sift this in to prevent lumps.) Stir until smooth. Once the biscuits are out, allow them to cool for 5 minutes. Then ice whilst they are still warm. 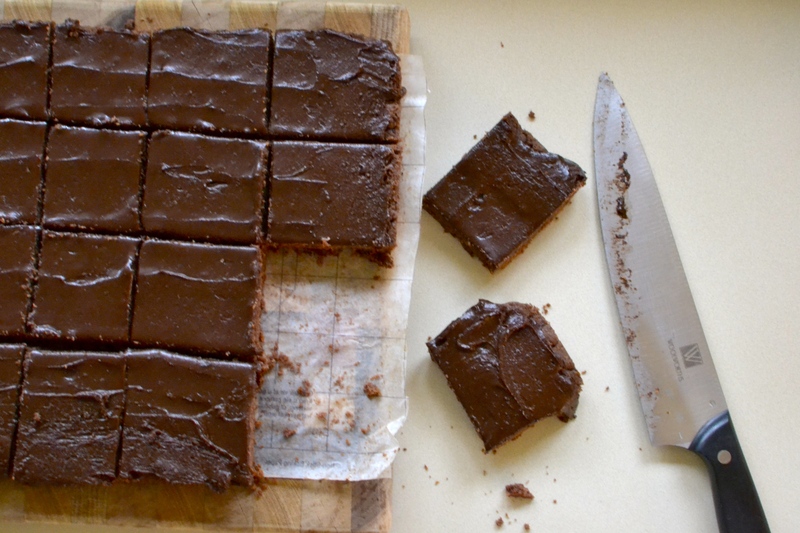 Slice them into squares and leave them to cool completely. Lovely post Al – those look delicious.